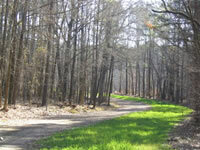 See the J. Strom Thurmond Lake website for additional information. Primary recreational opportunities are listed below. Factoid: Thurmond Lake is the largest Corps of Engineers lake east of the Mississippi River. The lake encompasses 1,200 miles of shoreline, 70,000 acres of water and 80,000 acres of land. The Corps operates 10 Class A campgrounds, five major day use areas and many other recreational facilities. Thurmond Lake provides excellent striper and largemouth bass fishing and its large wildlife management program provides excellent hunting and wildlife observation opportunities.